3. 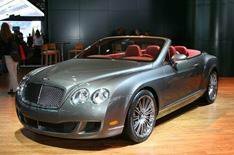 Bentley GTC Speed Convertible | What Car? If you're the sort of person who wonders what it's like to drive along with the wind in your hair at close to 200mph then a) we presume you don't wear a toupee, and b) you had better make a bee-line for your nearest Bentley dealer. However, if the thought of driving outrageously fast while sat in luxurious surroundings doesn't float your boat, then perhaps you also wondered what the Bentley GTC Convertible Speed was all about. The Speed has 600bhp, which is 48bhp more than the standard car. That means it can hit 200mph with the roof up, and 195mph with it down. It takes 4.5sec to travel from 0-60mph 0.3sec quicker than the standard model. The standard car also features a new stability control mode, called Sport Traction, which improves handling on loose surfaces. The standard car costs 129,700, benefiting from the recent VAT cut to be 2800 less than the previous model. The GTC Speed costs 146,100.